The skull, the bones around baby’s head, are not so ossified that they have become white. They are still fairly transparent so the brain is visible through the skull! Your baby’s body is also undergoing lots of changes. In their belly, the liver and stomach are developing at a rapid pace this week. 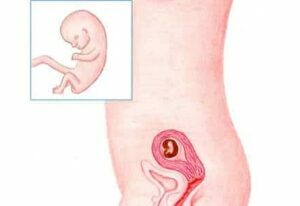 Baby has started a real growth spurt during which baby will grow about 0.8 inches per week! Your baby is now 1.22 inches long (on average) and weighs 0.14 ounces. Start looking into what form of childcare will suit your needs and register your baby at several childcare centers. There can be long waiting lists in some cities, so it’s best to sign up in time. This week it is quite normal for you to feel sick, weak and nauseous. The hormone hCG is at its highest levels now. Those levels will decrease somewhat after this week and most women will start feeling fitter and more energetic. If you have been taking folic acid you can stop. It is advisable to take a nutritional supplement developed specially for pregnant women. These supplements contain all the vitamins (including folic acid) and minerals you need alongside a healthy diet.